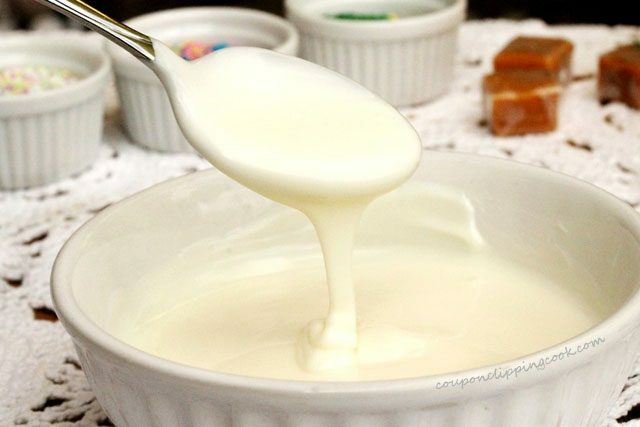 Easy to make and quick to disappear. Girl Scout Cookies are so good that they disappear really quick once the package is opened. What’s better than eating a Girl Scout cookie one at a time? Well, it’s eating them two at a time AND eating them with a lollipop stick. 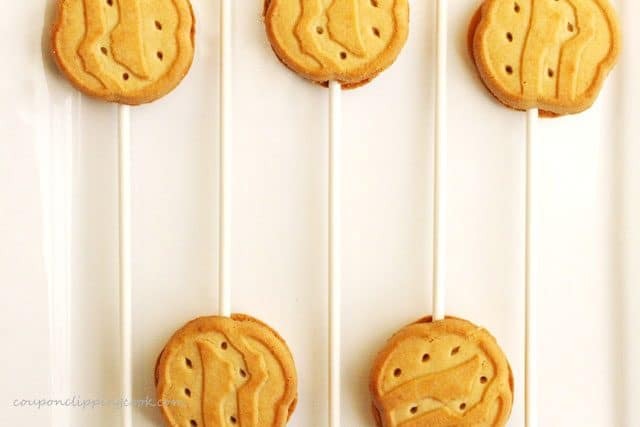 These Girl Scout Cookie Pops are a fun way to dress up Girl Scout Trefoil cookies and eat two of them at a time while your’re at it. 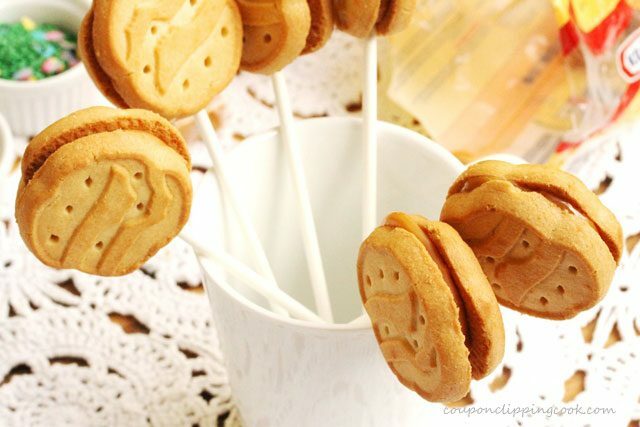 These cookie pops could actually be made out of any non-sandwich type cookie like chocolate chip cookies, sugar cookies, or even Lorna Doone cookies. YUM. 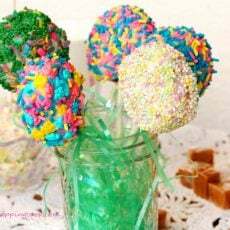 The best part of this recipe idea is that you can customize it with the color and type of candy sprinkles that cover the outside of the cookie pops. They can be made into DIY wedding or party favors. And they would be soooo pretty as a gift wrapped in cellophane with a ribbon. 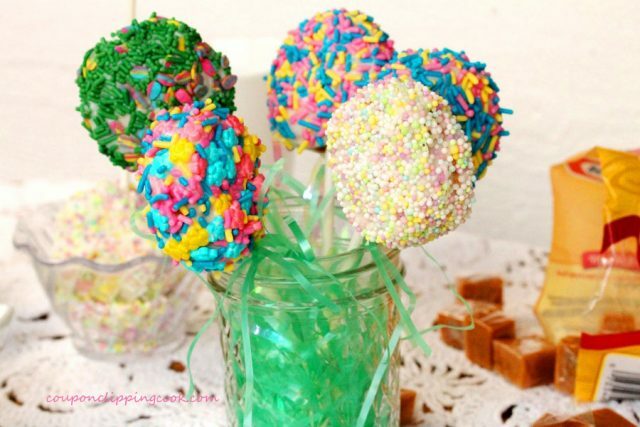 These cookie pops would also be adorable as a bouquet using Styrofoam as a base in a non-see-through-type vase. 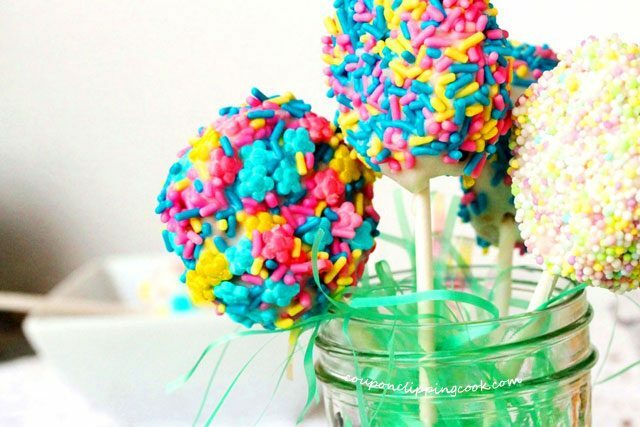 Or…you can just eat them all yourself! Why not, you deserve it! Just don’t be like me and drop the little decorative candies all over the kitchen counter…..then on the kitchen floor…..then walk on them with your bare feet and track them through the house. 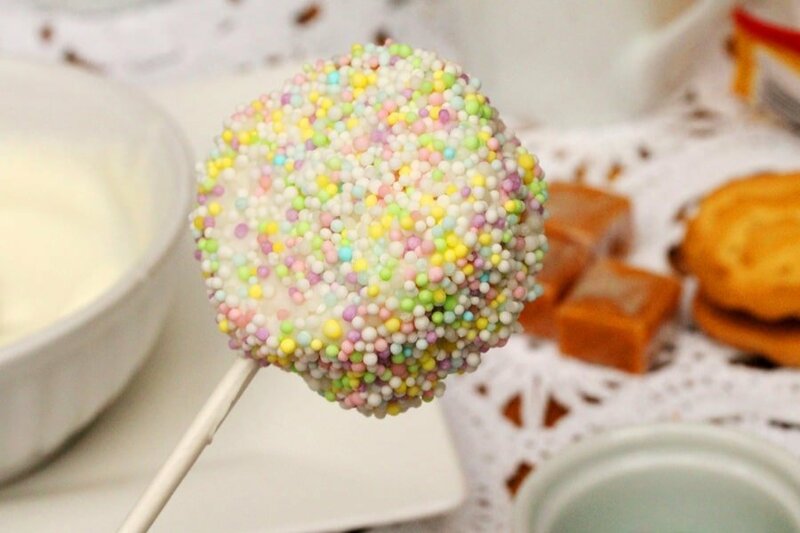 There’s nothing like those little tiny decorative nonpareil candy sprinkles stuck to the bottom of your feet. It’s very glamorous if you ask me. lay 9 cookies front side down so that the flat part of the cookie is facing up. Set aside the remaining 9 cookies. Set one caramel (unwrapped) on top of each cookie on the plate. 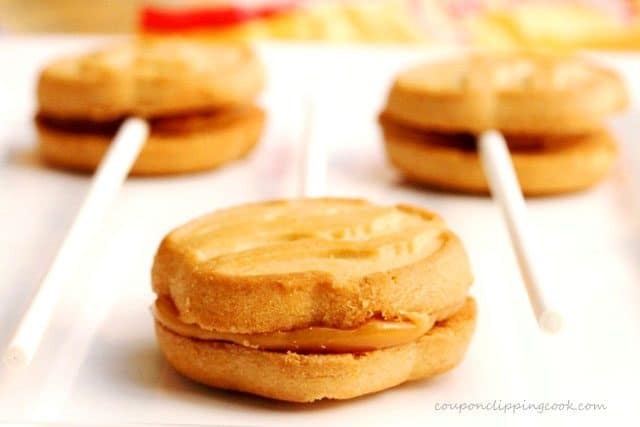 Try to put the caramel right in the middle of the cookie. 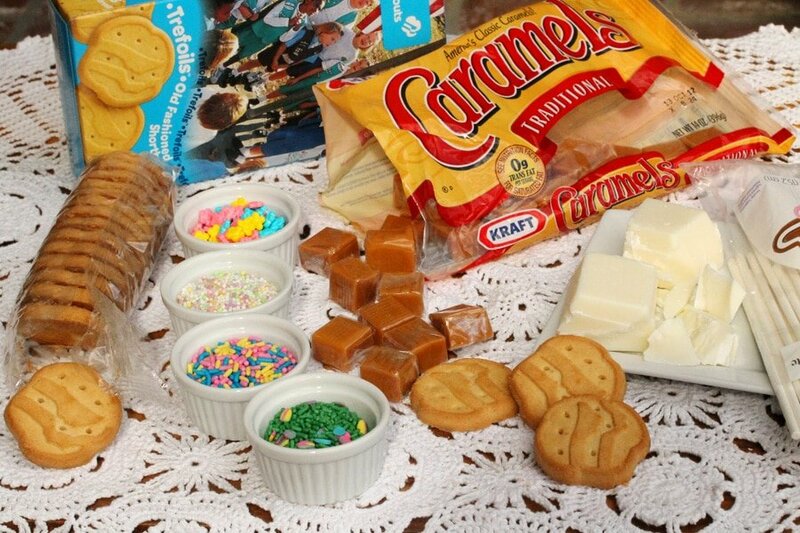 Next, transfer about 3 or 4 of the cookies with the caramel candy to a smaller plate that can go in the microwave. Heat the caramel (along with the cookie it’s sitting on) for about 20 seconds in the microwave. The idea is to heat the caramel just enough so it’s soft to the touch but not runny. 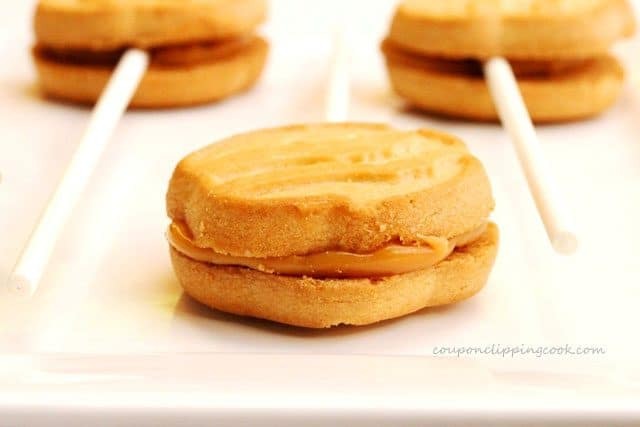 Remove from the microwave and poke a lollipop stick in the middle of the caramel. 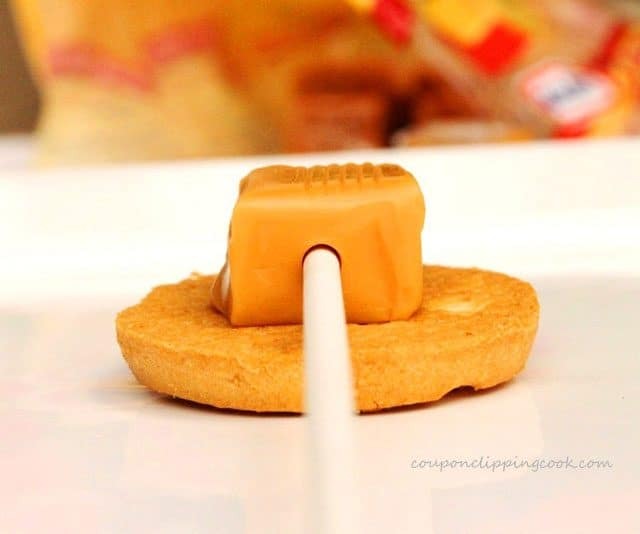 Poke the lollipop stick into one of the sides of the caramel rather than through the top of the caramel. 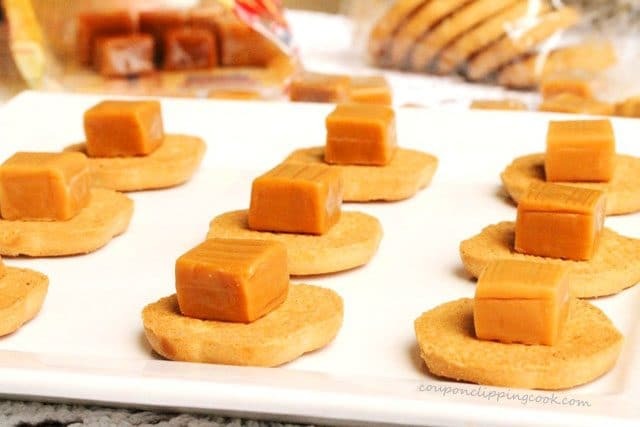 take one of the remaining cookies that was previously set aside, and lay it on top of the warm caramel with the decorative side up. 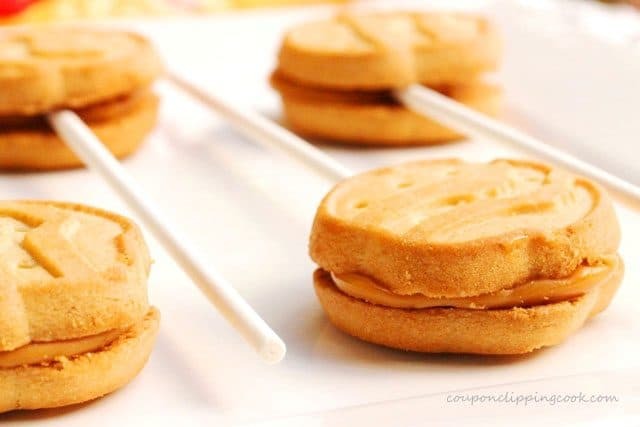 gently push the middle part of the top cookie down to make a “caramel sandwich cookie”. 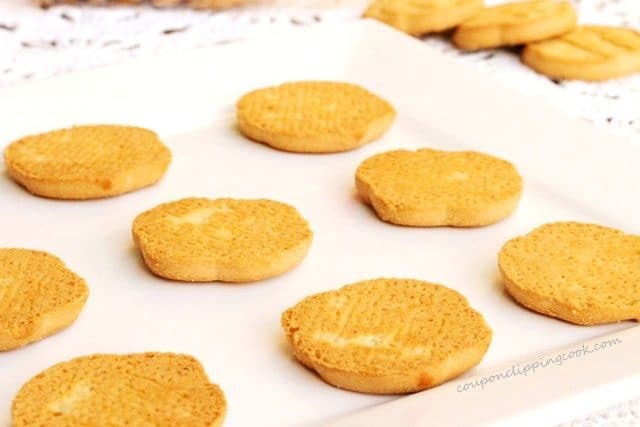 Make sure that the caramel is warm enough so that both the bottom and top cookies are sticking to it. 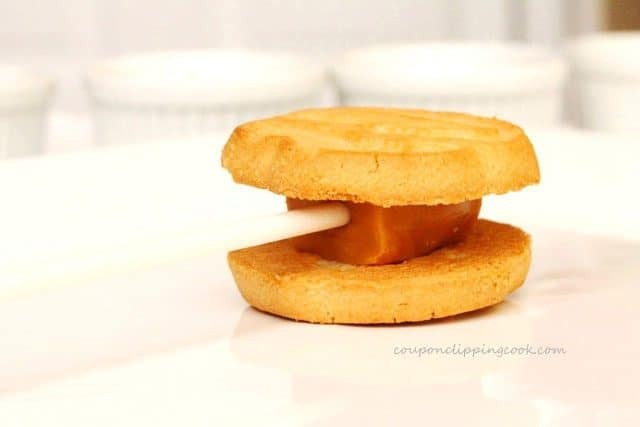 just pop the cookie with the caramel on top of it back into the microwave for about 10 seconds. Or it may take a few seconds longer to get the caramel soft. Just be careful not to get the caramel too hot or it will turn into caramel soup. 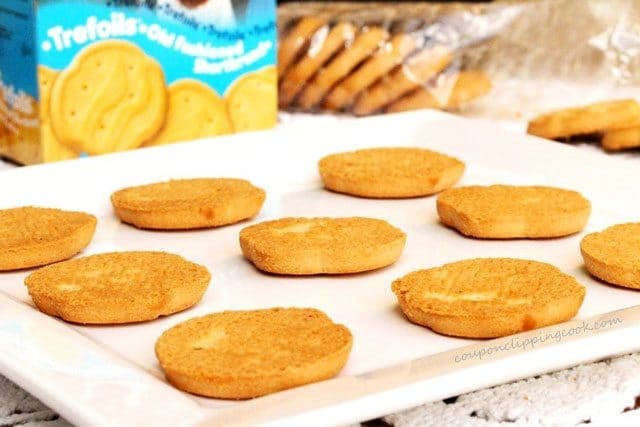 Repeat this process for the remaining cookies. 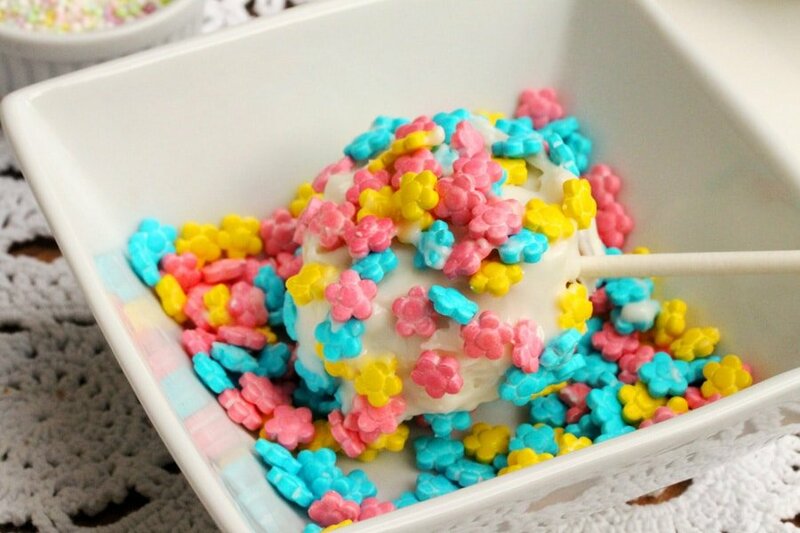 Add the candy coating to a small bowl that can go in the microwave. Heat the candy coating in the microwave for 30 second bursts until it’s melted, making sure to stir after each 30 second interval. dip the cookies (one cookie pop at a time) in the coating making sure the entire cookie is covered. 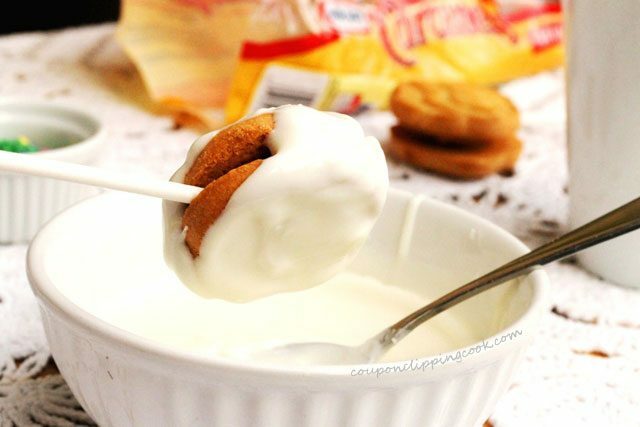 Hold the cookie by the stick upside down over the bowl so that the excess coating drips off. 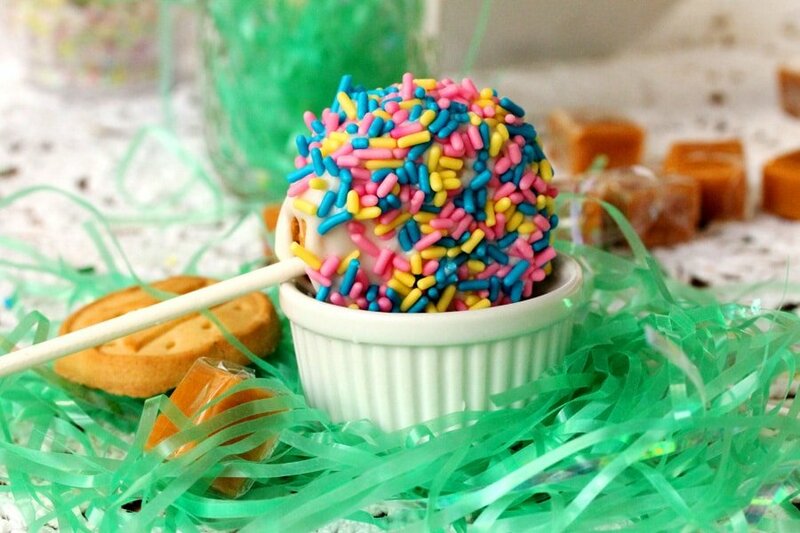 dip it in the candy sprinkles. 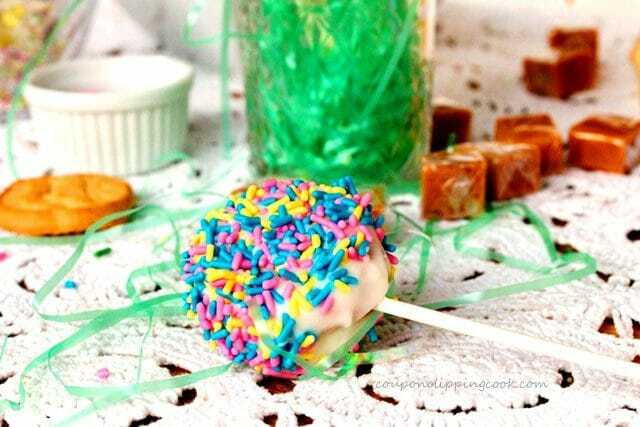 Use your fingers or a spoon to put the candy toppings all around the candy coating so the cookie pop is completely covered with candies. 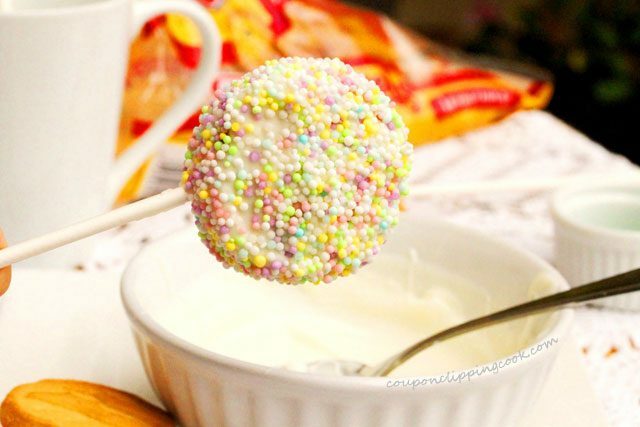 TIP – The candy sprinkles need to be added right after dipping the cookie in the coating so that the sprinkles stick nicely to all sides of the cookie pop. 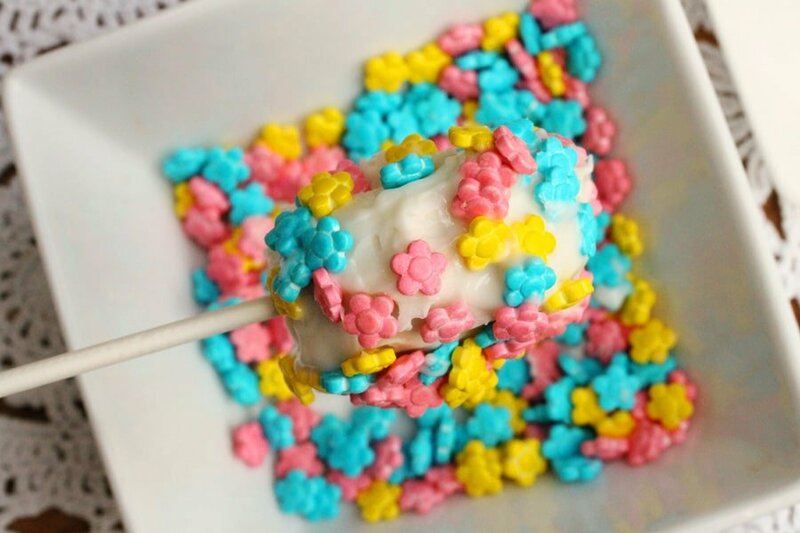 Use your fingers or a spoon to put the candy toppings all around the candy coating so the cookie pop is completely covered with candies. 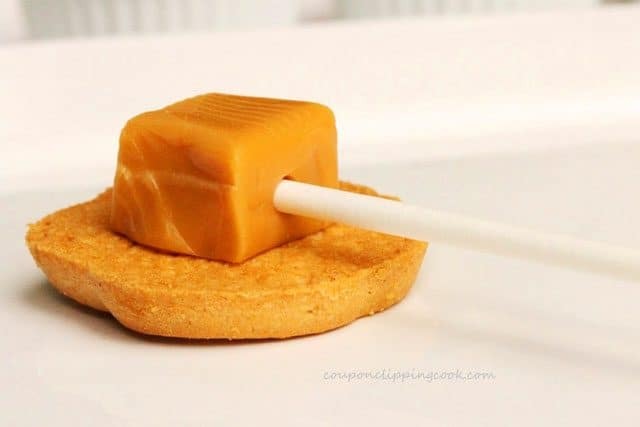 Then carefully put the cookie pop stick side down in a small drinking glass or mug to let the candy coating cool and set. Repeat the candy coating process for the remaining cookies. Reheat the candy coating that’s in the bowl as needed. 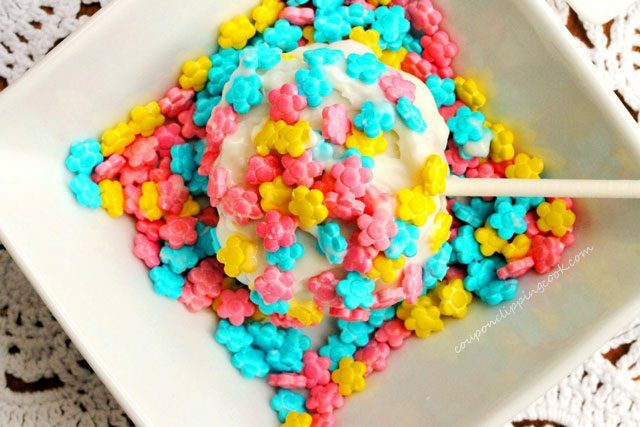 These are fun to make and to eat. 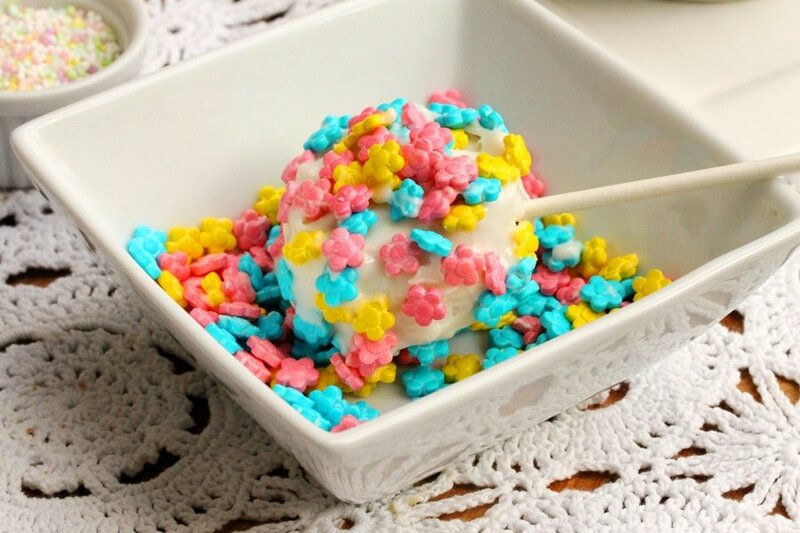 Such a pretty bouquet of cookie pops…. 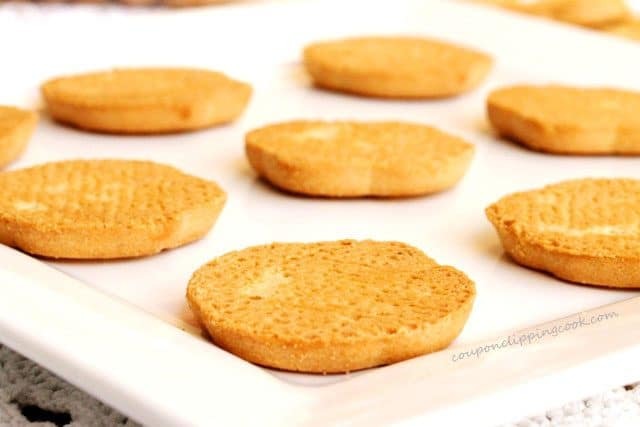 On a large plate, lay 9 cookies front side down so that the flat part of the cookie is facing up. Set aside the remaining 9 cookies. Set one caramel (unwrapped) on top of each cookie on the plate. 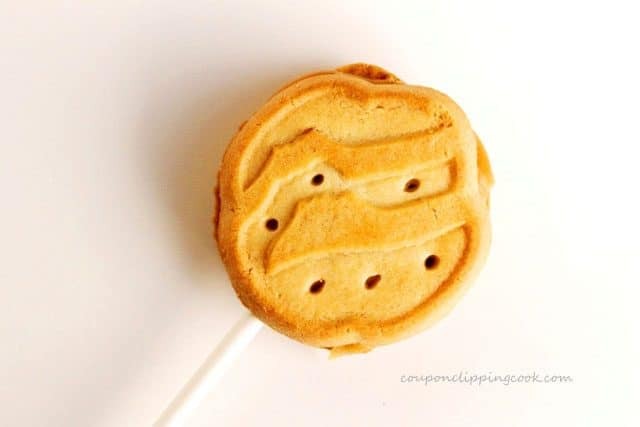 Try to put the caramel right in the middle of the cookie. 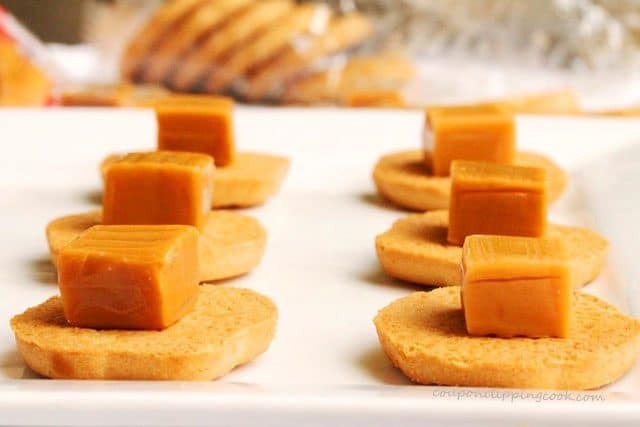 Transfer 3 or 4 of the cookies with the caramel candy on them to a smaller plate that is safe to put in the microwave. Heat the caramel (along with the cookie it’s sitting on) for about 20 seconds in the microwave. The idea is to heat the caramel just enough so it’s soft to the touch but not runny. 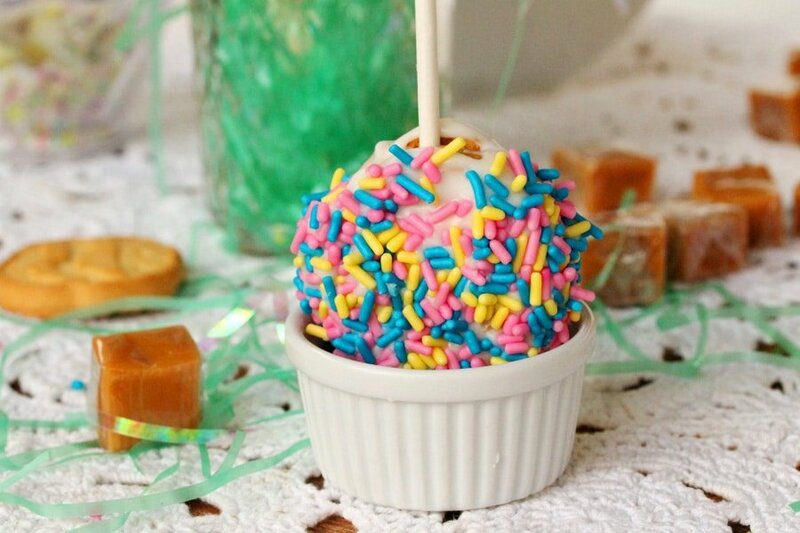 Remove from the microwave and carefully poke a lollipop stick in the middle of the caramel. 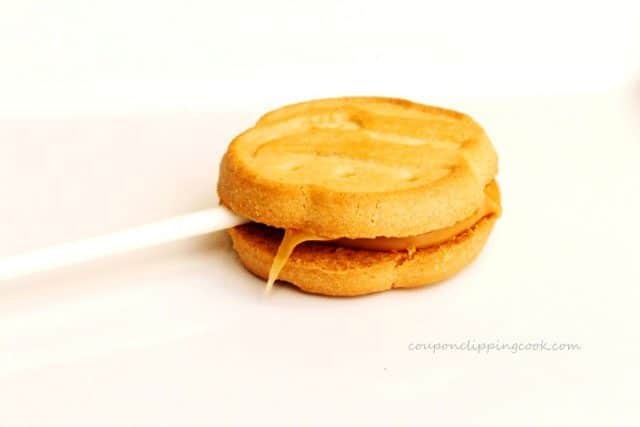 Poke the lollipop stick into one of the sides of the caramel rather than through the top of the caramel. 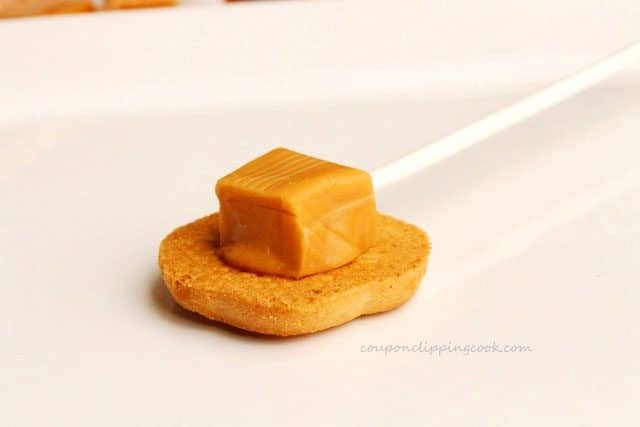 Then, take one of the remaining cookies that was previously set aside and lay it on top of the warm caramel with the decorative side of the cookie up. 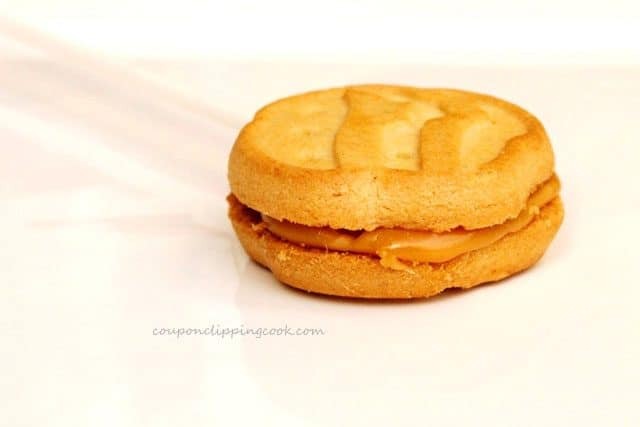 Gently push the middle part of the top cookie down to make a “caramel sandwich cookie”. 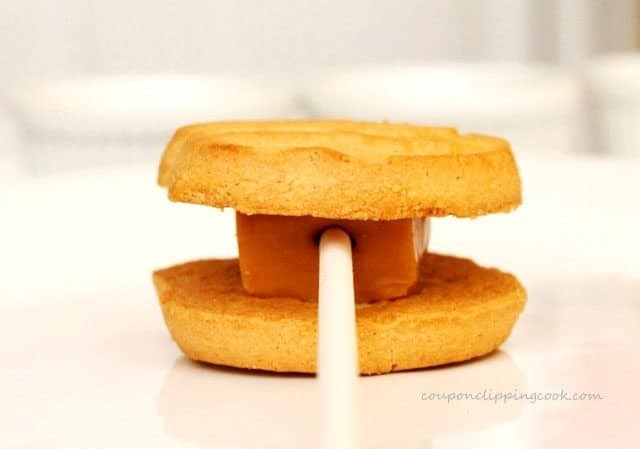 Make sure that the caramel is warm enough so that both the bottome and top cookies are sticking to it. Add the candy coating to a microwave safe small bowl. Heat the candy coating in the microwave for 30 second bursts until it's melted, making sure to stir after each 30 second interval. 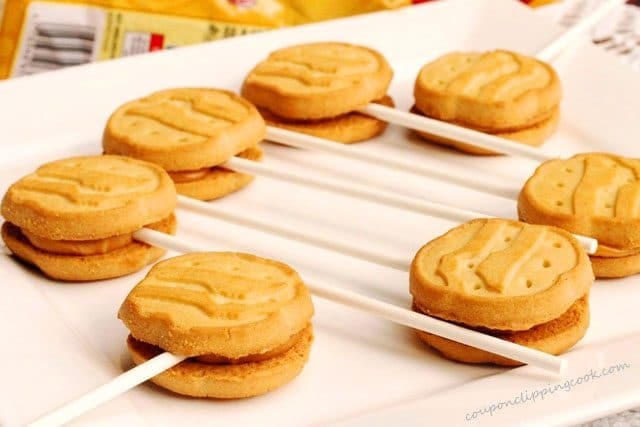 Once the candy coating is melted, dip the cookies (one cookie pop at a time) in it making sure the entire cookie is covered. 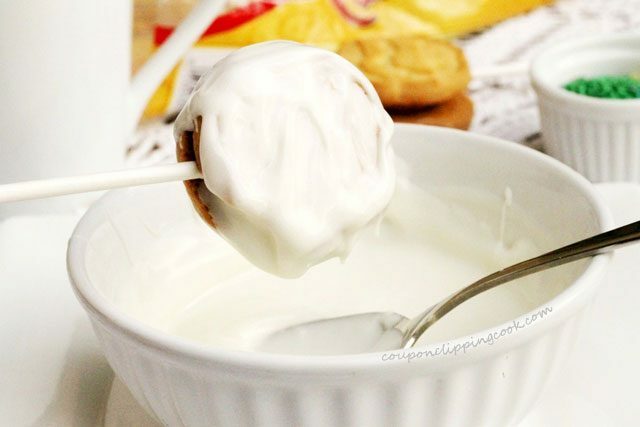 Hold the cookie by the stick upside down over the candy coating bowl so that the excess coating drips off. 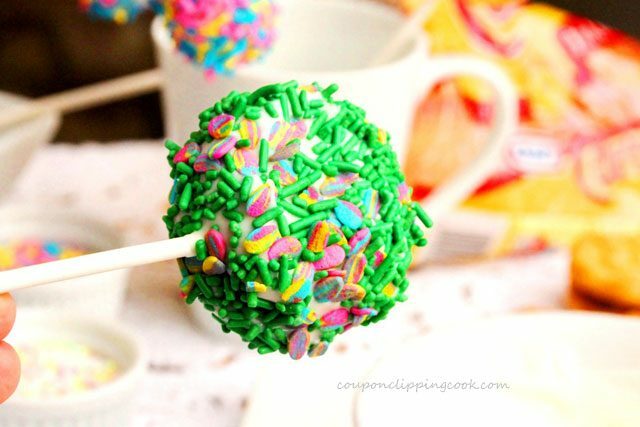 Right after dipping the cookie pop in the coating, dip it in the candy sprinkles. 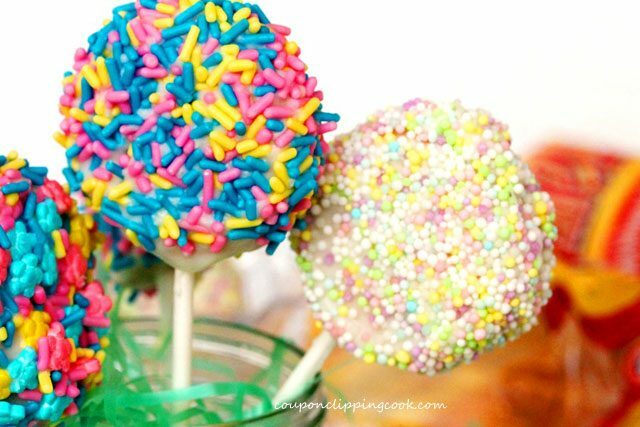 Use your fingers or a spoon to put the candy toppings all around the candy coating so the cookie pop is completely covered with candies. 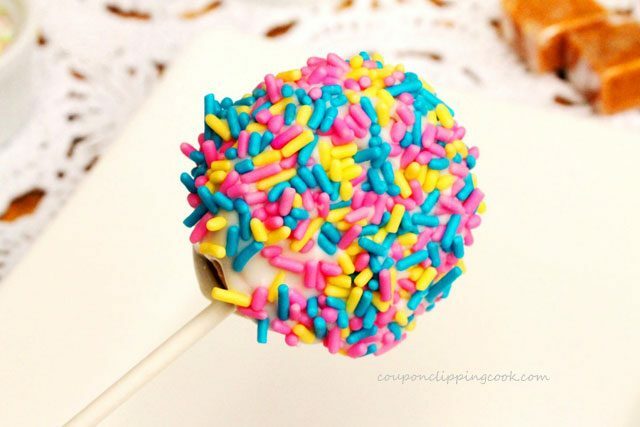 The candy sprinkles need to be added right after dipping the cookie in the coating so that the sprinkles stick nicely to all sides of the cookie pop. Repeat the candy coating process for the remaining cookies. Reheat the candy coating that's in the bowl as needed. Serve after the candy coating is set (about 15 minutes). Wow! These are SO creative and pretty…what a fun thing to make! Hi! lol. yes of course there were made with you in mind! Thank you for stopping by! 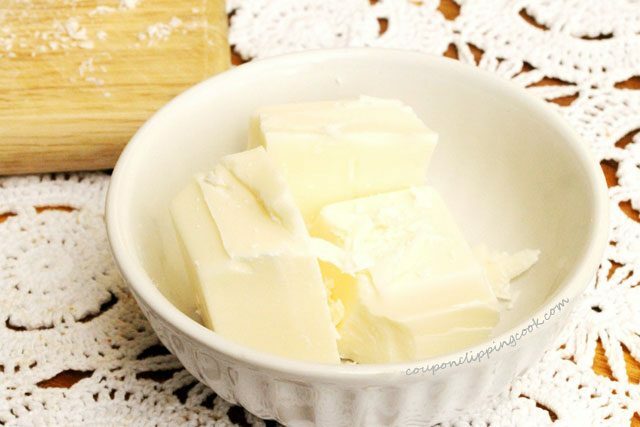 So easy to make, and I’m sure super delicious! 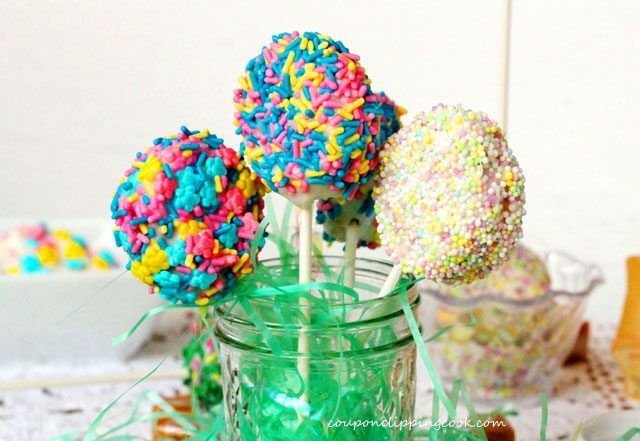 These could be really fun for a birthday or baby shower. Hi There, they sure would! 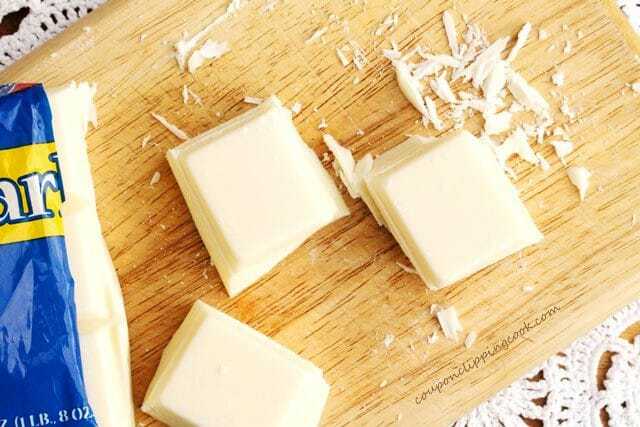 With a little food coloring, the white chocolate could be turned into a theme color too. So many ways to customize these. Thank you for stopping by! 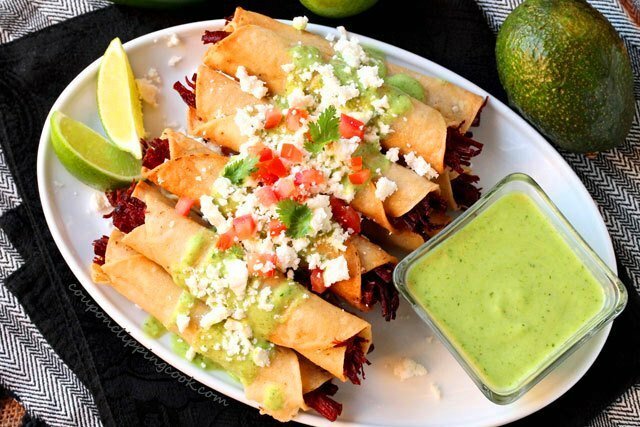 These look wonderful. What a great idea! 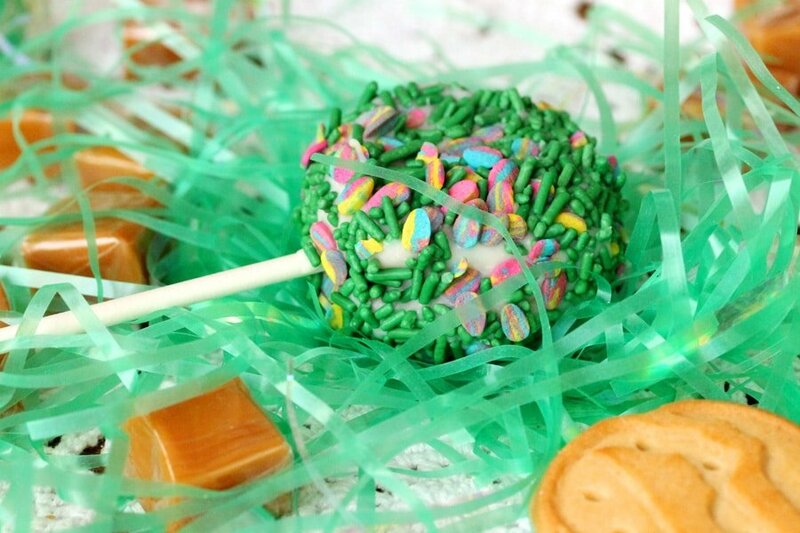 You put together a craft and a treat for 100’s of Girl Scouts! Can’t wait to try it! 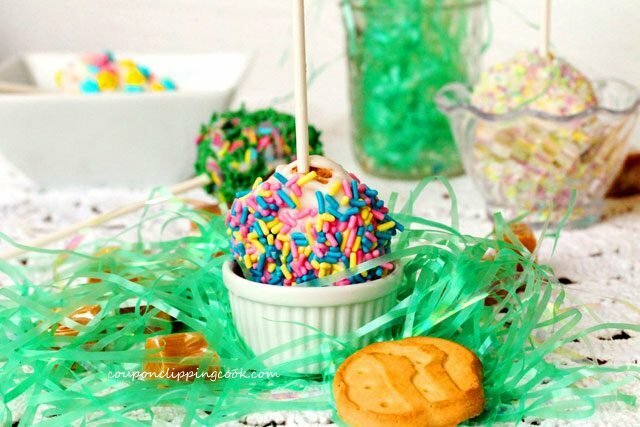 I have to agree but just reading your blog, that making this cookie pops would be a lot of fun specially with the kids around. 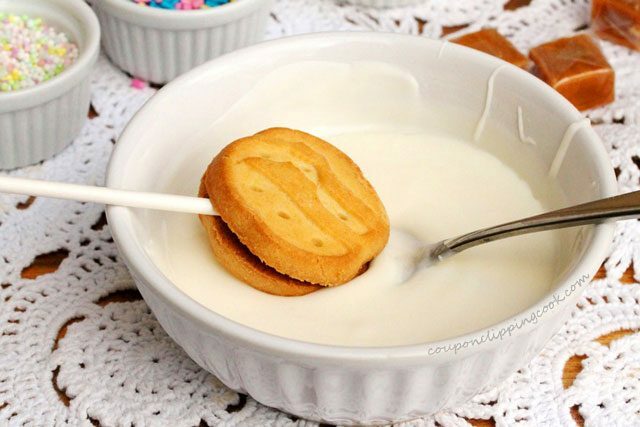 This is a delicious idea. These would make a terrific gift, but I would have to keep a few for myself-yum! Now my mind is reeling from thinking about all the cookie varieties and fillings you could do. However, shortbread is a great pic to start off with. Glad I stopped in to see this. Have a great day! Hi Tina, I know what you mean. 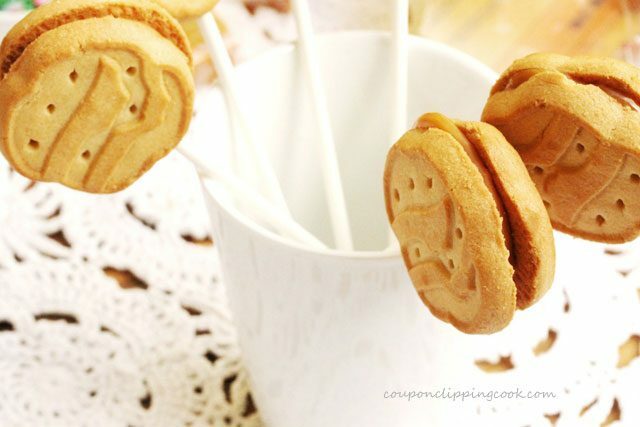 There are so many other ways to get the cookies to stick together with other types of fillings. Other types of topping too. Have a great day!